The chaos of Lebanon has thrown up an Arab horror parallelled only in post-invasion Iraq. It has also produced the Arab world’s most urgent intellectual life, and its first victory against Israel. Lebanon is the most contradictory of countries, “a more open, liberal and democratic society than any of its Arab neighbours” precisely because of “its vulnerability to domestic dissension.” So, with its seventeen sects and constantly shifting allegiances, who would dare to explain Lebanon? Which brings us to Maronite relations with Zionism, and therefore with the Palestinians, Hirst’s third factor of conflict. The struggle between pro and anti-Zionist Maronites started long before the Jewish state was established on the ruins of Palestine. Pro-Zionists, with the Maronite Church in the forefront, welcomed non-Muslim ‘European’ settlement in the region to compensate for their own demographic decline. Zionists originally envisaged a third of Lebanon for inclusion in Israel – a state “whose creation amounted to a vastly more arbitrary example of late-imperial arrogance, geo-political caprice and perniciously misguided philanthropy than Lebanon’s could have ever done.” In 1948 Zionist militias captured 13 Lebanese villages. In atrocities reminiscent of the Nakba unfolding in Palestine, 80 people in the village of Houle and 94 in Saliha were slaughtered when their homes were exploded over their heads. By the time the dust had settled, there were 17 Palestinian refugee camps in Lebanon, accounting for 12% of the population and a worrying (for the Maronites) increase in the proportion of Muslims in the country. Restrictions were imposed on Palestinian employment in every sphere except manual labour. Palestinian organisers suffered persecution by the notorious intelligence service, the Deuxieme Bureau. When Jordan expelled the PLO in 1970, Lebanon became the main base for Palestinian resistance. Fatahland, or the Fakhani Republic, was established as a state-in-exile. This was important for Arafat’s plan to prove the institutional existence of the Palestinians to the West, but abuses alienated the villagers of the South, and staggeringly violent Israeli responses to Palestinian attacks increasingly polarised Lebanon’s politics. From 1975 to 1982, what Hirst calls the ‘Palestinian half’ of the civil war, two conflicting camps can be identified. The National Movement, led by Druze chieftan Kemal Jumblat, including Druze, Sunni Muslims, and Leftists (many from the Greek Orthodox community), allied themselves with the Palestinians. On the other side stood pro-Zionist, anti-Arabist Maronites represented by Pierre Gemayel’s unashamedly fascist Lebanese Phalange. At first, with passive support from Syria, the National Movement prevailed, but a Syrian volte-face in 1976 robbed it of its victory. Israel invaded in 1978, pushing Palestinian fighters north of the Litani river and setting up the mercenary South Lebanon Army in their place. In the 1982 invasion Israel reached Beirut and subjected it to atrocious bombardment. Hirst points out that it was the Camp David treaty – removing Egypt from the Arab front – which allowed Israel to lay siege to an Arab capital, and to kill at least 20,000 Lebanese and Palestinians. Israel’s General Sharon (facilitator of the Sabra and Shatila massacre) envisaged mass deportations of 200,000 refugees to Jordan. Beyond expelling as many Palestinians as possible, Israeli war aims involved turning ‘Christian Lebanon’ into a formal ally, thereby transforming the region from ‘Arabist’ to ‘pluralist’ (in Zionism’s own Orwellian language). Israel was successful in removing the PLO from Lebanon, and in this respect won a great victory. Exiled to Tunis, Arafat’s men lost touch with the Palestinian grass roots and began the decline that would end with Oslo and the replacement of the liberation organisation by a collaborative ‘authority’ policing the West Bank and Gaza. Even if ‘Christian Lebanon’ (after the assassination of Bashir Gemayel) was unable to reorient the country according to Zionist wishes, Israel can’t have been too upset by the post-Palestinian status quo. The second stage of the war was characterised by extreme fragmentation. The country was split into ten cantons contested by 150 militias and factions. By now, after so many years of brutal conflict, the pathologies of the warriors often superceded strategic concerns. Christians fought Christians, Palestinians killed Palestinians, Shia slaughtered Shia. The 1990 Taif agreement (which retained the confessional system while improving Muslim political representation), and the geopolitical ramifications of Saddam Hussein’s invasion of Kuwait, finally established a heavy-handed but stable pax Syriana. But behind the superficial chaos of 1982 to 1990, an epochal change had occurred – the rise of the Shia, Lebanon’s largest sect, and specifically Hizbullah. The Shia were Lebanon’s poorest, most despised community, and had played almost no part in the early stages of the war. But they had been developing a more militant identity since Musa Sadr launched the Movement of the Deprived in 1974. They were inspired by the Islamic Revolution in Iran and radicalised by Israeli occupation. On 23rd October 1983, 241 US marines and 58 French soldiers (both countries had taken sides, the French with the Maronites and the Americans with Israel) were killed in car bomb attacks carried out by the shadowy Islamic Jihad, an organisation whose key players would later form Hizbullah. The Israelis, meanwhile, were relentlessly beaten back by a resistance more ferocious than they had ever met before. By 1985 Israel had withdrawn to its self-declared ‘security strip’ in the south, 10% of the country. Israel had unwittingly stumbled into the turning point of the Lebanese war, and possibly of the larger regional conflict. For the first time its army suffered a series of minor defeats by a combination of sword – Hizbullah and Iran (which offered to send 50,000 troops in 1982; Syria turned this down) – and shield – Syria (re-equipped by the USSR after the initial Israeli advance). Hirst remarks correctly that the same actors are facing off today. He devotes a chapter – ‘Triumph of the Warrior Priest’ – to Hassan Nasrallah’s transformation of Hizbullah into the key player it is now. Nasrallah oversaw the party’s retreat from its maximalist aim of creating an Iranian-style Islamic state in Lebanon, sought accomodation with other sects, and brought Hizbullah into parliament. In May 2000, Israel made an “ignominious scuttle” from the country. This was the first time that occupied territory had been liberated without Arab concessions. When Israel reinvaded in 2006 it expected to finish the resistance in a few days. Instead it bled in the border villages for five weeks. The Sixth Arab-Israeli War ended in defeat for Israel and the loss of its hitherto enormous psychological deterrent power. Hizbullah had grown from a barely-visible terrorist militia to the developing world’s most effective guerrilla group, and now to a semi-conventional army able to repulse invasions. 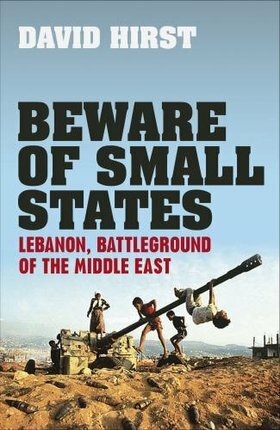 By perceptively drawing out historical trends, “Beware of Small States” gives structure to what, as lived, was often no more than a bloody mess. This indispensable history of Lebanon is also a history of Lebanon’s neighbours, the larger Middle East, and the superpowers. The book is an essential tool for understanding a tragic story which has not yet reached its end, and is very highly recommended. Thanks for the very helpful review. Are the Russians equipping Syria? What are the links between them? Bath socialism?